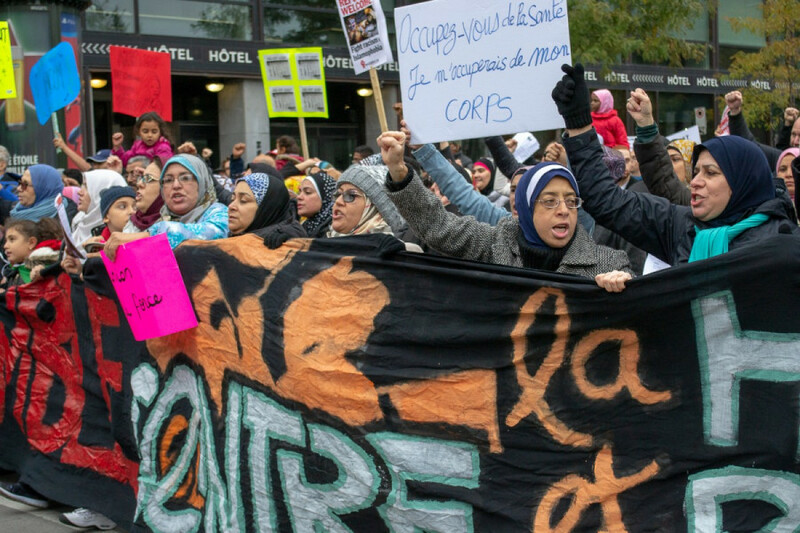 Approximately 2000 people gathered to condemn Quebec’s newly elected premier Francois Legault’s and the Coalition Avenir Québec’s “racist policies” on Sunday at a demonstration against racism. “This proposed law is misogynistic and racist,” said Safa Chebbi from Alternatives on Legault’s plan to ban people from wearing religious symbols. Earlier this week, Legault said he plans to use the notwithstanding clause—a clause that allows provincial legislators to overturn parts of the Charter of Rights—to ban public servants such as teachers, judges and prosecutors in Quebec from wearing Muslim hijab, Jewish kippa or Sikh turban in the workplace. “[It’s] strengthening hate and divisions in our society,” Chebbi said. Vice president of the Federation of Women of Quebec, Marlihan Lopez said that the CAQ’s proposal on religious symbols divides people. For Lopez, the objective of the law is to stigmatize Muslim women—an already vulnerable group. Chants of “refugees in, racists out. Immigrants in fascists out,” resonated as protestors passed the John A. MacDonald statue on Rene-Levesque, which was once again defaced with red paint over the weekend. Many also booed as they passed the statue. Legault’s proposed policies for newcomers, such as submitting immigrants to French and Quebec value tests and cutting immigration levels by 20 per cent, were contentious in Montreal throughout the election campaign. On Thursday’s 13th annual vigil for missing and murdered Indigenous women, Mohawk activist and artist Ellen Gabriel from Kanehsatà:ke community voiced her own frustrations over the latest provincial elections, saying Indigenous rights and sovereignty was hardly up for discussion. “It was a complete shame this campaign, it was really hard,” said Maya Cousineau Mollen, who is from the Innu Montagnais First Nation and member of Wolf Pack Street Patrol—an initiative that aims to help Indigenous homeless in Montreal.